Wisdom of the Moon: I Think I May Have a Problem. I Think I May Have a Problem. Hello, my name is Wendy, and I’m addicted to Mason jars. They are just so handy for so many things. Every time I see them on sale (and they’re always on sale at this time of year), I pick up another dozen. -I prefer using Mason jars for leftovers in the fridge because they don’t get all stained and grotty like plastic does. And the glass never absorbs smells. Even if they’ve harbored some science experiment gone horribly wrong, I can actually sterilize them in boiling water. Also, everyone can see exactly what is in them, which actually encourages them to eat it. After a couple of days in the fridge, if it doesn’t look like it’s actually going to get eaten, I pop the freezer-safe jars directly into the freezer. -Whenever I buy a bunch of fruit on sale, or for some other reason end up with lots of it about to go bad, I freeze the excess for smoothies. I've found that it's best to lay the fruit out flat on a cookie sheet and freeze first, then put the already frozen fruit in the jars- it’s much easier to remove this way. You can use as little or as much as you need. -It’s also great for storing particularly stinky items in the fridge, like pieces of onion or opened cans of wet cat food. Those lids really keep the smells contained. -I love to store things in the freezer that would otherwise go bad because I use so little of it at a time. Most of these are ingredients that I use as flavoring when I cook. I keep whole ginger (that I grate on a rasp as I need it), rolls of bacon (3 strips stacked together, rolled up and frozen flat), cubes of chipotles in adobo sauce, cubes of tomato paste, left-over Parmesan rinds (to add to soups) and left-over wine for deglazing pans (which never completely freezes, so you can spoon out the slushy stuff as needed). 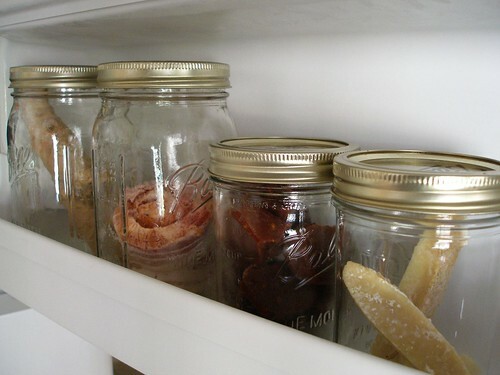 -I always use Mason jars to freeze liquids like soups and stocks. 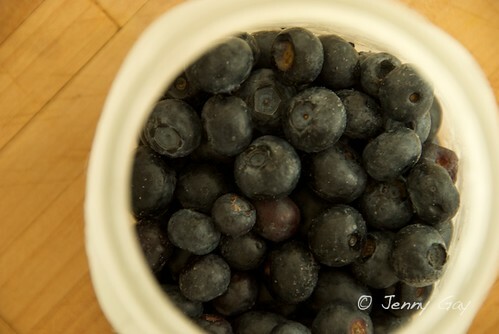 Whenever I have left-over stock (homemade or out of the can) I put it directly in a jar and into the freezer. The soups I put in half-pint jars for lunches remembering to leave an inch or so of headroom because the water they contain expands when frozen. Note- It's important to make sure to use freezer safe jars because the expanding liquid can easily crack the glass otherwise. -They're great for storage, both cold and at room temperature. 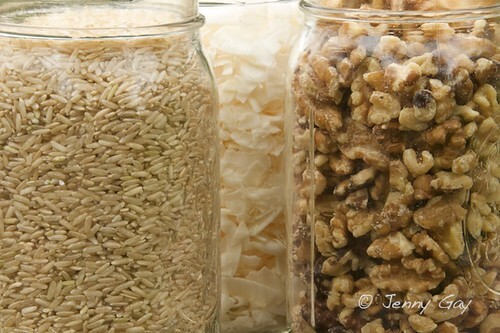 I keep dry goods that tend to go rancid (like brown rice, nuts and shredded coconut) in mason jars in the top shelf of my fridge. And I have several shelves in my kitchen with things like beans and lentils and grains. 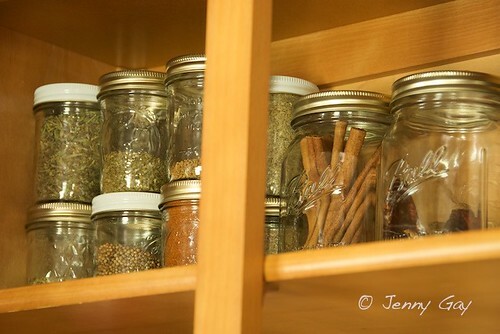 I also use the tiny mason jars to store the extra whole spices (that aren't on the door) in the cupboard. Seeing all of these beautiful ingredients can sometimes get me going when I’m in a cooking funk. Well, I love Mason jars too, but I have not put them to as many great uses as you have! I'm going to start, though. I use them a lot in my sewing room to keep little bits and pieces in, because they look pretty on shelves and I can see what's there at a glance. For the sewing room, I especially like to find the really old jars at yard sales and thrift stores. Ohh!!! I love jars as well! Not quite as much, but I love them none-the-less. They're also better than plastic for storing in the fridge because they're more eco-friendly! The fridge doesn't have to work as hard to keep glass cold as it does to keep plastic cold...so this = less energy used! I love your blog, and have a feed from it so I don't miss any of your posts. I really liked the family pictures from Disneyland. No,no, it's not you with the problem, it's me!!! Sorry about the mixup. Even tho it wasn't your family in the Disney pics, they were still good. And I DO love your blog, too! You are not alone in your addiction. You will find mason jars in my studio, and my children's studio, in my fridge, in my cupboards, in the garage. They are the ideal and natural way to store a plethora of items. NOW I have a ton more ideas to use the ton of jars!! 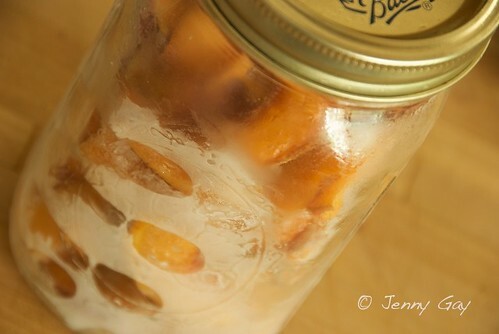 Do you know....are all Ball jars freezer proof? I was just getting ready to ditto tayzzman's comment about your cupboards, fridge and freezer ... and ask when you had gone to Disneyland and why hadn't I seen the photos ... when I saw that she retracted the Disneyland part! I don't use Mason jars much and the ones I get usually come filled with my mother's fig preserves so I always give them back to her when they're empty, but seeing this... I SO want to get Mason jars too! HAHA! i hear you! mason jars rock! the possibilities are endless! although i must admit mine dont look so organized! they are all crammed into the back of the cupboard- but being see through it doesn't matter so much! we love them in the craft room for beads, glitter, etc, to hold our nature treasures, perfect replacements for when we can't find our water bottles, clothes pins, we collect dryer lint in one. ok i will stop there, because maybe i am looking obsessive too! Ooo, pretty! Thanks for the inspiration - what a great idea. Much better than leftover Cool Whip containers!! hee hee! me too! though i also save and label scrub anything i happen to buy that comes in a jar with a good lid. my husband always laughs at what i end up squeezing in jars. but you're totally right, sterile, clean, clear, cute, stylin, cheap. what's not to love? i also drink out of them, love the wide mouth no cup has ever come close. Renee, I myself have run across a jar or two that I know is not freezer proof- based on the way it cracked open in my freezer. ;) It'll say whether it's safe for the freezer on the side of the box. 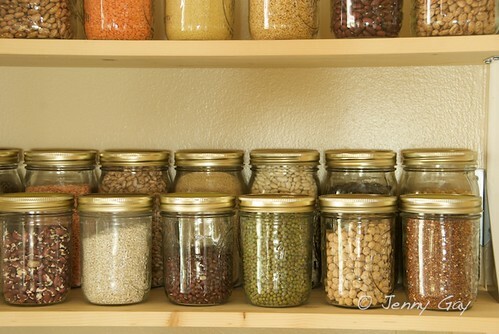 Your cupboards are so much more organized than mine, but I too love mason jars and use them to store everything I can. Have you found the 1/2 gallon jars yet? They are great for storing bulk items like flour, rice, sugar, or even buttons, spools of thread, etc. I've really been enjoying your blog. Thanks for sharing. I am a jar whore, too. None go to waste and the hardware store clerk knows that when they put out a new style of jar, I'll be by to pick some up. Now that they have the silver rings and lids - I want to redo the whole kitchen. Because I'm a spaz like that. I just found your blog today and am excited to add you to my feed & read through your posts! I wanted to ask, where do you find such a good variety of jars? Most stores in my area seem to only carry one size, but then my area is a little.... um... backwards. Jen, I've bought most of them at either the grocery store or the hardware store (Ace). They've got the best selection at this time of year. Also for Christmas last year, Jeff bought me some special smooth sided ones from Amazon. I had a project I wanted to try, but so far I haven't perfected it so I haven't posted it. Your shelves look so pretty and colorful! So at least your "problem" looks good! And, look, I finally reset my password so that I can leave comments as me instead of as anonymous. 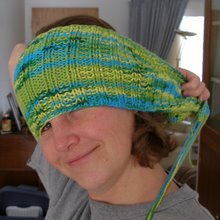 Well I am new to Pinterest so I have just been exploring all of these different pictures and came across your blog post. I have just gotten into using mason jars myself and I absolutely love them. I have since transferred all of my bags and boxes and everything I had in my pantry into these great mason jars. I do juicing as well so I use them in the refrigerator. I am a vegan so I eat salads all the time. So I've been creating salad in a jar and they work wonderful. The thing that really got me sold was that a Foodsaver has a mason jar attachment and lets you get all of the air out of it which lets your food stay fresher even longer. It's amazing these jars have been around forever and they're still such a great value and great product! See some things do last forever!